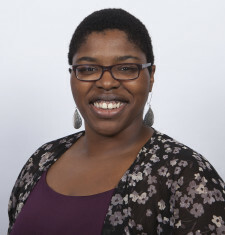 Foluke Beveridge is a nonprofit marketer, arts education enthusiast, and dancer at heart. She is currently the Marketing & Communications Coordinator and a teaching artist at Moving in the Spirit. Born and raised in Newport News, Virginia, Foluke has spent a lifetime in the arts, from African dance, ballet, and modern to the clarinet, with some creative writing and theater woven in. In 2011, she earned a BA in communication studies with a minor in dance from Randolph College in Lynchburg, Virginia. While in undergrad, she was heavily involved in the dance department, taking class and performing from her second year until graduation. After working in education and retail, she decided that her path in life must involve finding ways to support both the arts, social justice, and young people. With that in mind, she enrolled in the Master’s program in arts administration at the Savannah College of Art and Design in Atlanta, Georgia and completed her degree in the summer of 2015. She has worked with the Atlanta Black Theater Festival, ArtsNow, Spellcast Entertainment, and SCADShow Theater.